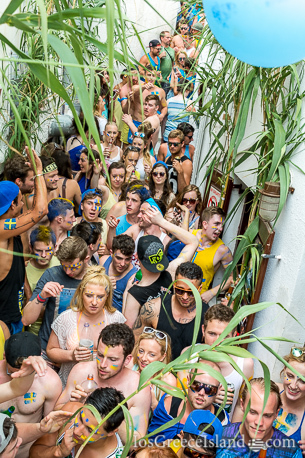 The Swedish Midsummer Party is one of the biggest happenings in Ios island every summer. 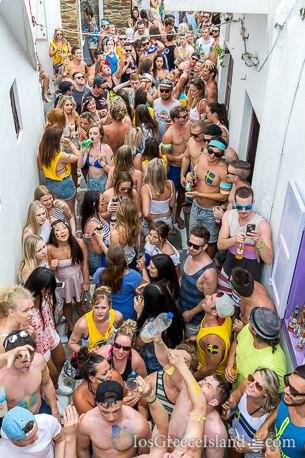 Travellers from around the world gather for a crazy day in Ios. Many Swedish people come to the island to celebrate Midsummer but everyone is welcome to join the fun. We are all swedes on this day. The Swedish Midsummer Party starts at 9 in the morning, with drinking in the village in the area around Flames bar. The narrow alleys of old Chora quickly fills up with happy people celebrating Midsummer. Many of the bars are open so you can either be inside drinking and dancing or be outside in the sun with your friends partying in the streets. The store right among the bars is also open with great prices on things to drink on this hot day. 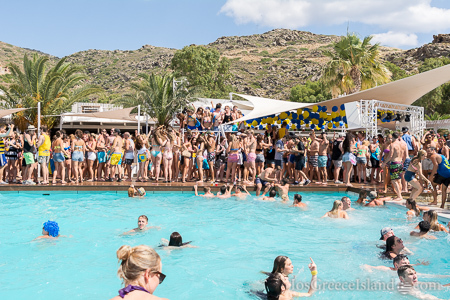 In the early afternoon the party moves down to the beach and to the Far Out Beach Club where the Swedish Midsummer party continues around the pool. 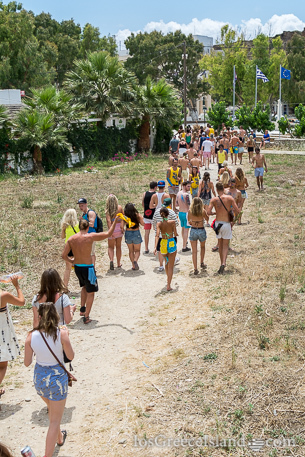 Everyone walks down together from the village to the beach together. It’s a big blue and yellow parade with the Swedish colours. The Swedish Midsummer Party at Far Out Beach Club continues long into the evening and then in the night the party once again moves up into the village where the bars and clubs are open until the sun rises once more. 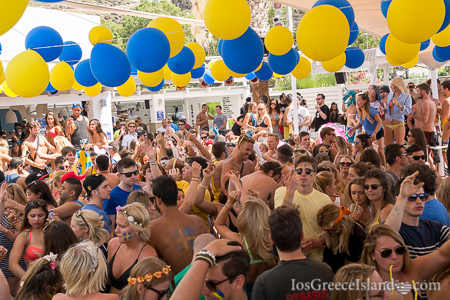 When is the Swedish Midsummer Party in Ios Greece? The party always takes place on the Friday that occurs between June 19 and June 25. 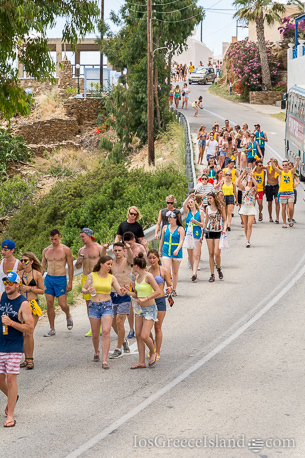 I have listed the dates for the next years below so that you can plan your holiday if you are travelling to Greece and want to experience the Swedish Midsummer in Ios. Why is it celebrated in June? So why is the midsummer party celebrated already in June, that is not the middle of the summer, is it? Well it’s an old Swedish tradition that originates from the celebration of the summer solstice, which is the longest day of the year with the shortest night. This happens around June 21, and after that day the days begins to shorten and the nights grow longer again in both Sweden and in Ios Greece. So we celebrate this with a big Midsummer Party from early morning to late in the night. The pictures on this page is from The Swedish Midsummer Party 2015. You can find older pictures from Midsummer 2006 here. 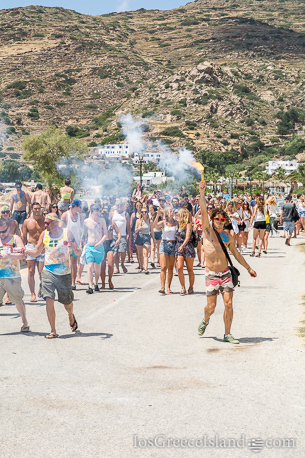 I hope you join us next year in Ios Greece for an even bigger party! If you have any questions then don’t hesitate to ask.